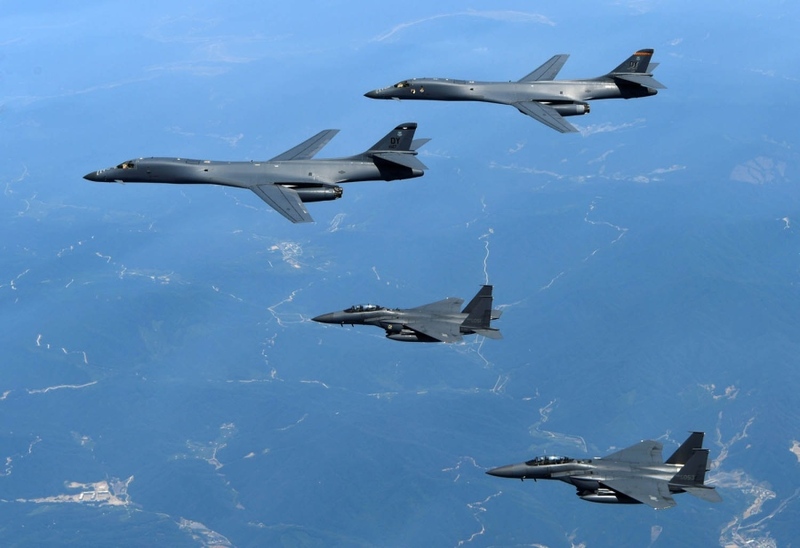 SEOUL: The US military flew two Air Force B-1B Lancer bombers over the Korean peninsula in a show of force late on Tuesday amid high tensions over North Korea’s nuclear and missile programmes, South Korea’s military said. The two B-1B bombers were accompanied by two F-15K fighters from the South Korean military after leaving their base in Guam, the South’s Joint Chiefs of Staff said in a news release on Wednesday. The US military said in a separate statement Japanese fighters had also joined the drill, making it the first night-time combined exercise for the US bombers with fighters from Japan and South Korea. After entering South Korean airspace, the two bombers carried out air-to-ground missile drills in waters off the east coast of South Korea, then flew over the South to waters between it and China to repeat the drill, the South’s release said. The South Korean military said this was part of a regular exercise to bolster military defences and also to display the alliance between the United States and South Korea. “This is a clear demonstration of our ability to conduct seamless operations with all of our allies anytime, anywhere,” the US release quoted him as saying. The US bombers had taken off from the Andersen Air Force Base in Guam. In August, Pyongyang threatened to shoot intermediate-range missiles towards the vicinity of Guam, a target frequently subjected to sabre-rattling from the North. South Korean and US government officials have been raising their guard against more North Korean provocations with the approach of the 72nd anniversary of the founding of North Korea’s ruling party, which fell on Tuesday. North Korea has launched two missiles over Japan and conducted its sixth and biggest nuclear test in recent weeks in defiance of U.N. sanctions as it races towards its goal of developing a nuclear-tipped missile capable of hitting the United States. The North Korean party anniversary passed without any missile launches or nuclear tests, but officials are wary the North could engage in more provocations at any time, especially with China to begin its all-important Communist Party Congress on Oct. 18.